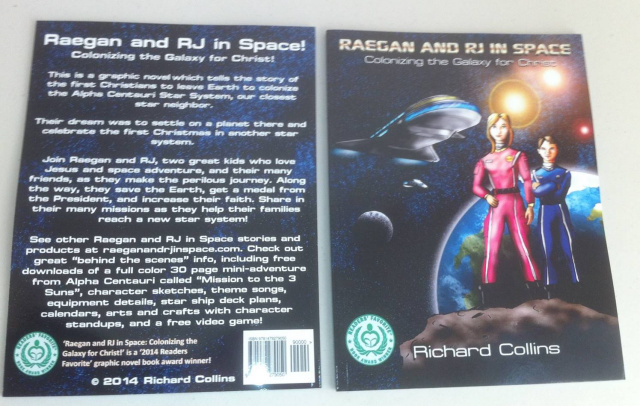 'Drawing Raegan and RJ in Space: Colonizing the Galaxy for Christ' cover: This cover was done by Mr Robert Stimpson of Colorado. 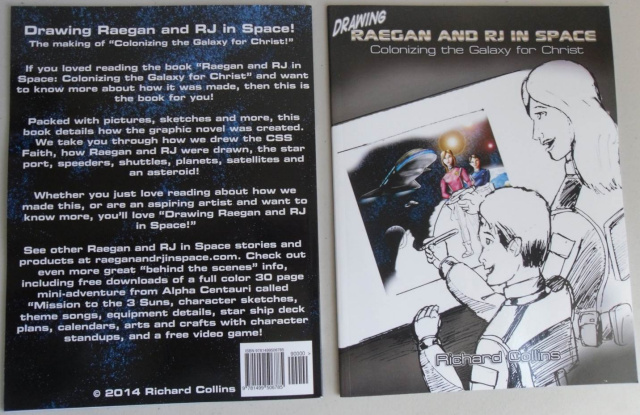 The cover shows an unfinished Raegan and RJ drawing a scene from 'Raegan and RJ in Space!' This shows what the book is all about, how the graphic novel was drawn! Because this graphic novel has less than 100 pages, there is no side binding lettering, the binding is just black. 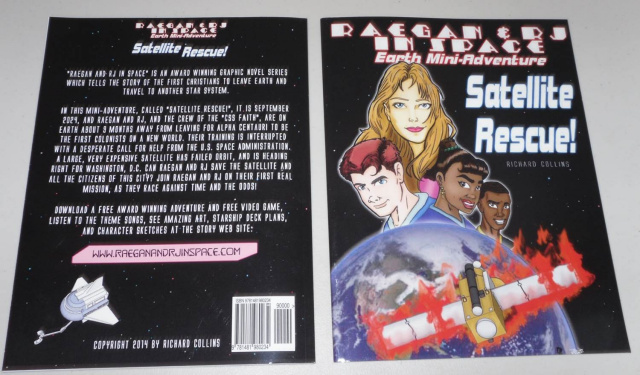 'Satellite Rescue' Earth Mini-Adventure Cover: This cover was done by Mr D.L. Maffett of Georgia and Mr Donald Armstrong of Canada. 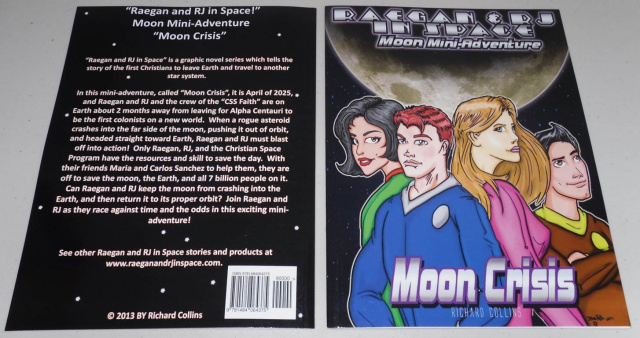 The cover shows Raegan, RJ, and their friends Imogene and James in their space suits. Also is the satellite that is burning in over the U.S and a great picture of the Earth. Imogene and James are in two other stories, 'Solar Storm' where they help Raegan and RJ with that crisis, and also in 'The Deepening Sea', where they are leaving on another star ship to colonize a different star system with their parents. Because this graphic novel has less than 100 pages, there is no side binding lettering, the binding is just black. 'Mission to the 3 Suns' Alpha Centauri Mini-Adventure Cover: This cover was done by Mr D.L. Maffett of Georgia and Mr Donald Armstrong of Canada. The cover shows a great shot Raegan, RJ, Joseph, Olivia, Stanley, and Ella in their space suits. Also is the 3 suns of Alpha Centauri: Yelow A, Orange B, and Red Proxima! Finally the cover shows a great picture of New Bethlehem, which is the planet in the Alpha Centauri system they colonized. Because this graphic novel is less than 100 pages, there is no side binding lettering, the binding is just black. 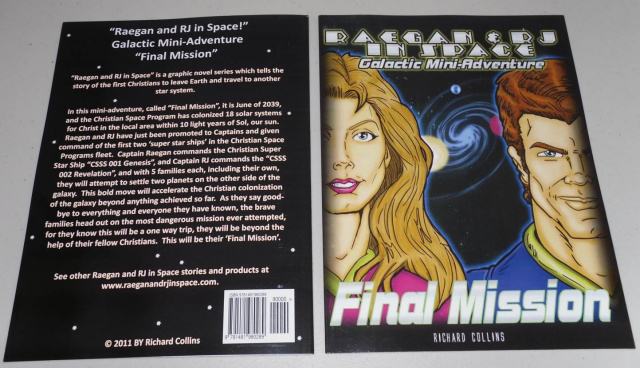 'Final Mission' Galactic Mini-Adventure Cover: This cover was done by Mr D.L. Maffett of Georgia and Mr Donald Armstrong of Canada. 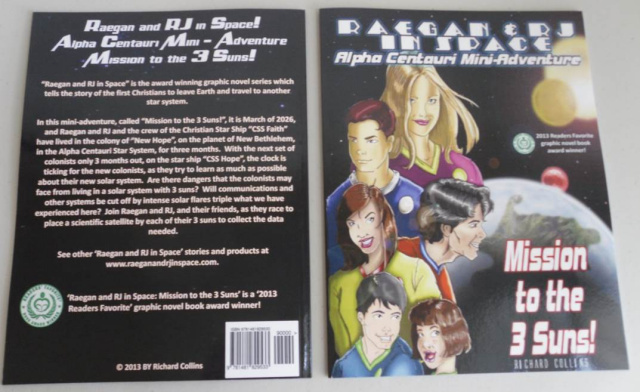 The cover shows Raegan and RJ when they are all grown up and Captains of the first two Christian Super Star Ships the 'CSSS 001 Genesis', and the 'CSSS 002 Exodus'. It also shows a picture of our Milky Way Galaxy with Sol represented by the yellow sun on our side of the galaxy, and the blue and pink stars on the other side of the galaxy that RJ and Raegan colonize in this story. Because this graphic novel has less than 100 pages, there is no side binding lettering, the binding is just black. 'Moon Crisis' Moon Mini-Adventure Cover: This cover was done by Mr D.L. Maffett of Georgia and Mr Donald Armstrong of Canada. 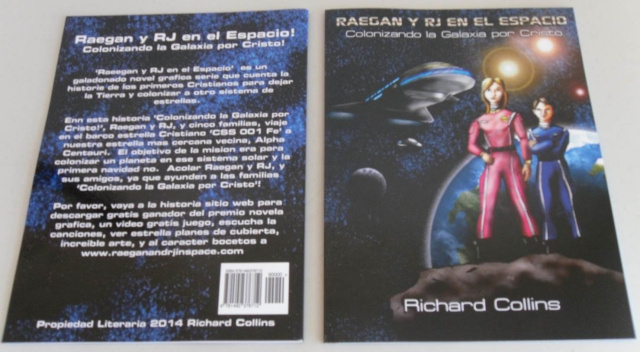 The cover shows Raegan, RJ, and their friends Maria and Carlos Sanchez in their space suits. It also has a great shot of the moon. Maria and Carlos were also featured in the graphic novel 'R&RJ Save the Day!' where in that story they were from a different space agency, and were trapped on the moon. After that crisis, Raegan and RJ invited the Sanchez family to join our Christian space program, and they accepted! Because this graphic novel has less than 100 pages, there is no side binding lettering, the binding is just black. 'Solar Storm' Sun Mini-Adventure Cover: This cover was done by Mr D.L. Maffett of Georgia and Mr Donald Armstrong of Canada. 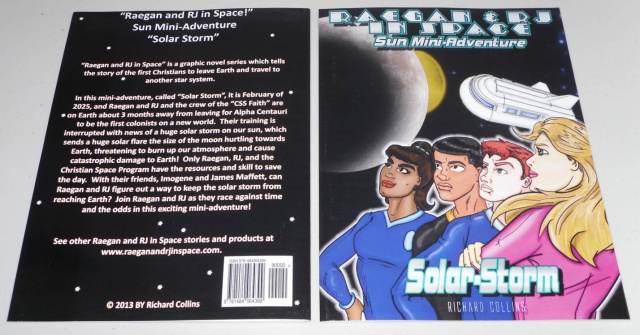 The cover shows Raegan, RJ, and their friends Imogene and James in their space suits. It also shows a great shot of the moon and sun, and an awesome shot of one of the shuttles. Imogene and James are also in two other stories, 'Satellite Rescue' where they are on the cover and at the moon with their parents in a shuttle when the crisis happens, and also in 'The Deepening Sea', where they are not on the cover but during the story they are leaving on another star ship to colonize a different star system with their parents. Because this graphic novel has less than 100 pages, there is no side binding lettering, the binding is just black. 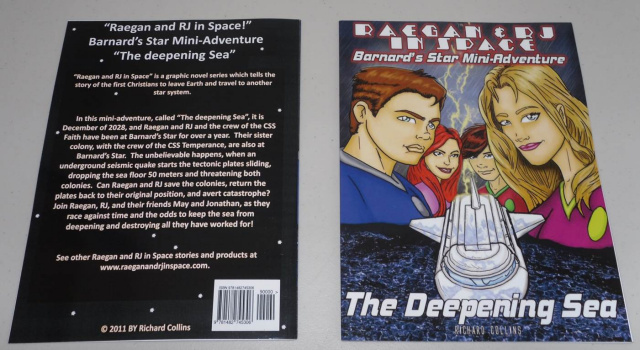 'The Deepening Sea' Barnard's Star Mini-Adventure Cover: This cover was done by Mr D.L. Maffett of Georgia and Mr Donald Armstrong of Canada. The cover shows Raegan, RJ, and their friends best friends May and Jonathan. It also shows a great shot of the shuttle going into the violent sea on the mission. Imogene and James are in this story but not on the cover, where they are leaving on another star ship to colonize a different star system with their parents. Because this graphic novel has less than 100 pages, there is no side binding lettering, the binding is just black. 'Raegan and RJ Save the Day' Cover: This cover was done by Ms. Jennifer Lusong of the Phillipines. The cover shows a great shot of Raegan and RJ in their space suits at the moon, the Earth in the top right corner, and finally a zooming shuttle flying into action. Beause this graphic novel has less than 100 pages, there is no side binding lettering, the binding is just black. 'Firts to Mars!' Cover: This cover was done by Ms. Jennifer Lusong. 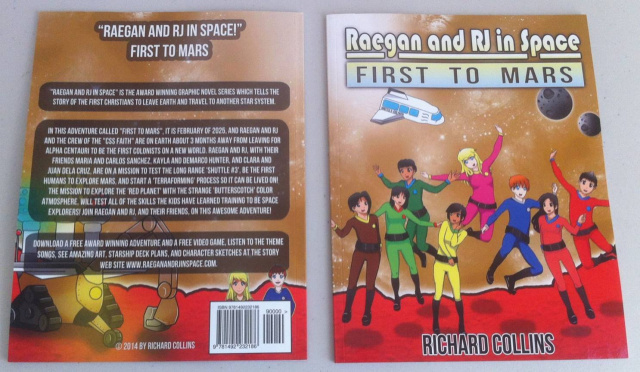 The cover shows Raegan, RJ, Carlos, Maria, James, Imogene, Clara, and Juan on Mars. Also it shows a Type 3 shuttle, and teh two moons of Mars! The atmosphere is butterskotch, and the ground is red, because of the unique proerties of the Martian atmosphere and soil. There is no binding because it is less then 100 pages. 'Celebration at Alpha Centauri!' cover: This cover was done by Ms. Jennifer Lusong. The cover shows the Christian Star Ship 'CSS 001 Faith' arriving at the planet of New Bethlehem in the Alpha Centauri Star System in 2025. It also shows the 3 suns of Alpha Centauri, and a great shot of Raegan and RJ in their space suits. Because this graphic novel has less than 100 pages, there is no side binding lettering, the binding is just black. Trilogy Covers by world famous book cover artist DUNCAN LONG: These are pictures of the covers for the trilogy. One of the things we wanted to do with the trilogy is produce a graphic novel set that would look great on a book shelf or a coffee table. We thought this was really important because full color printing is so expensive. We want you to be proud to leave it out and show it to folks. Needless to say, we think we hit a home run here. Each book has an awesome and stunning cover by one of the most famous cover artists in the world, Duncan Long. Go to his web site http://www.duncanlong.com and check out some of his work. We went with the best here. He has been noted as one of the top 2 cover artists in the world. The covers are all in one theme so they truly are a trilogy, not just 3 different scenes. That is why the covers of this trilogy is so unique, from the very beginning they were meant to go together and were themed. If you like the way these graphic novels look, go to the "Order Graphic Novel" page and order a set from Amazon to put on your book shelf or coffee table! "Go Raegan and RJ in Space!" .If you like the way these graphic novels look, go to the "Order Graphic Novel" page and order a set from Amazon! "Go Raegan and RJ in Space!" Cover 1, below, shows Raegan and RJ in their space suits. It also shows Raegan and RJ wearing the medals they were presented by the President for saving Earth from the incoming asteroid. Cover 1 also shows the CSS Faith taking off from Earth to go to Alpha Centauri in 2025 with our yellow sun in the background. 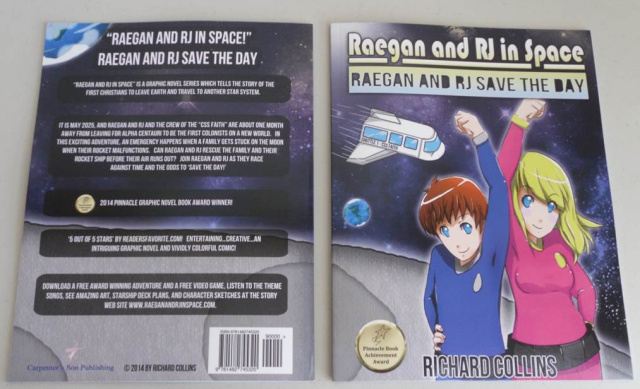 Cover 2, below, shows Raegan and RJ in their space suits. It also shows the medals they were presented by a space explorers society for being the first people to explore a black hole. Cover 2 also shows the CSS Faith taking off from the planet of New Bethlehem to go to Barnard's Star in 2027, with the 3 different suns of the Alpha Centauri system, yellow, orange, and red, in the background. 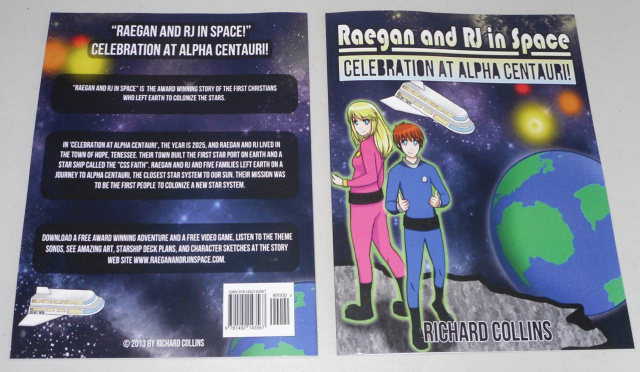 Cover 3, below, shows Raegan and RJ in their space suits. It also shows the CSS Faith taking off from the planet of New America to go back to Earth in 2029, along with Barnard's Star, the red sun, in the background. In addition, cover 3 shows two other colony ships, the CSS Temperance and CSS Patience, heading back to Barnard's Star after the welcoming ceremony. The spine of each cover and back covers are black for the space theme, with white lettering and white stars. This makes it look like a space adventure. Finally, the font on the front and back covers is "Handel Gothic BT", which has a very futuristic look, and is non-standard, which means it costs a lot of money to purchase the rights to and use. There again, we went the extra mile with the font, to make sure this was a quality product and looked good. I am just the guy who created them, so you may think I am biased in my praise for these covers, but remember, I am also a science fiction lover and reader, who has spent countless hours in the book stores over the years looking at science fiction novels, and their covers, as I was deciding which one to buy. Please enjoy looking at these photos of the covers.